The new Eaton XLR-48 supercapacitor module delivers high reliability, high power and ultra-high capacitance energy storage and is available now at TTI, Inc., a world leading specialist distributor of electronic components. Utilising electrochemical double-layer capacitor (EDLC) construction, the Eaton XLR-48 supercapacitor module can be used as a sole energy source or in combination with batteries to optimize cost, lifetime and run time. With ultra low ESR for high power density, the XLR-48 offers design lifetime up to twenty years, with millions of charge/discharge cycles throughout the life of the application. Physical features of the XLR-48 include its heavy duty metal housing, which is robust and suitable for high vibration, high current uses. An IP65 rating means the device is water jet washable. An industry-standard form factor enables easy integration into multiple applications. The XLR-48 is manufactured using environmentally-friendly materials for a green power solution. 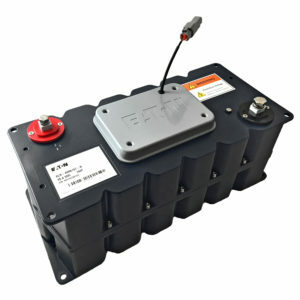 Thanks to its wide operating temperature range, the Eaton XLR-48 supercapacitor energy storage device suits a wide range of environments and types of installation location, including: hybrid and EVs; grid storage; commercial vehicles (trucks, mining equipment, construction vehicles); underground rail and marine applications.